There are stories so epic that they change you after the reading of their tales. As a child who grew up with tales of Middle Earth and Narnia, who rolled dice for the first games of Dungeons & Dragons ever released and dreamt of Boldly going when no one had gone before… I have high standards and award 5 stars stingily. This is one of my 5 star favourites. The Deed of Paksenarrion is a large “mass market edition” of Elizabeth Moon’s brilliant first fantasy trilogy that gathers up all six hundred thousand words of her original novels in a single volume. My copy is well loved and growing tattered with each visit, but it remains a truly amazing and original world in which to lose yourself. It reads like the best D&D adventure ever played as it chronicles the adventures of Paksenarrion Dorthansdotter, a tall young girl who runs away from an arranged marriage to a pig farmer in order to learn all she can about becoming a warrior. Anyone who has ever Larped, RPG’d, rolled dice or dressed up as a character, will find themselves wishing they could be part of this amazing tale, despite the trials and tribulations as the main character and those around her are swept from one adventure to another. The thrilling saga weaves itself to an astounding and satisfying conclusion with plenty of weaving paths along the way. You can almost sense Paksenarrion “leveling up” as she gains experience as a mercenary fighter and is eventually claimed by a higher calling. Elizabeth Moon creates a lush world of kingdoms in peril, mysterious elves, evil plots and tangled loyalties that is both believable and engrossing. Once you get caught up in the first chapter, you find yourself struggling to put the book down for such mundane things as eating or sleeping. A few of the stains on my copy are proof that I got so engrossed in this story that the spoon or fork got distracted on its journey to my mouth! The Deed of Paksenarrion does not shy away from the ugly side of war, the perils of the command chain or the fears that face the helpless. It does not glorify battle the way some video games seem to either. Instead, Elizabeth Moon creates a truly outstanding story where battles are marvelous echoes for all of the struggles we humans face in our lives. The courage and determination, the tenacity and conviction with which some of these vivid characters face their destinies reminds us that humans are capable of great things. We have only to try instead of running away or taking an easier, darker path. If you have never read The Deed of Paksenarrion, hunt it down. It MUST be on your book “bucket list”. I wish I could share your excitement as you read it for the first time. If you have already discovered how truly unique and amazing this book is, chime in and share what you loved best about it as a comment. I was thrilled when Moon returned to this timeline in 2010 and created a different set of slightly overlapping adventures that take place after the events in The Deed of Paksenarrion. It gives me more things to read and review before the end of the year and this challenge! One of the challenges of owning a vast book collection is always what to read next after a major binge. Having spent most of the summer with my nose in Darkover novels, I fully intended to move back to something else in this genre. Then I was tucking the last two Darkover novels back into their place on the shelves and had to rearrange the B section a tiny bit, stumbling over my two Richard Bach books in the process. The Bridge Across Forever is billed as a love story on the cover and details the author’s adventures to discover his soul mate, the ultimate person that he was meant to spend his life with. While tenderly and poignantly written at times, this book also contains a lot of selfishness and narcissistic navel-gazing. The problem with Great Truths in life is that they are so often delivered through us fallible human beings. Great paintings, music, plays and words all have the power to touch us to the core… if only we can get past the flawed medium trying to put such glory into words. This is not to say that Bach portrays himself as perfect and blameless. He is very good at detailing the flaws in his life and problems that keep he and Leslie Parish apart for so long. The story of their trials and tribulations is both frustrating and inspiring at the same time. One is a sort of sequel to The Bridge Across Forever and is perhaps the more powerful of the two booked. I was hooked and intrigued from the moment I read the words on the back cover. “I gave my life to become the person I am right now. Was it worth it?” The book deals with the intriguing idea that we are all part of a much larger whole and that ultimately, despite our restrictive individual perceptions, which trap us as our “reality”, we are ONE. The novel contains the unique blend of inspirational writing and storytelling that first made Bach famous in Jonathan Livingston Seagull. While both books stand as a testament to what Richard experienced during his marriage with actress Leslie Parish, the fact remains that the story beyond these books did not have a happy ending. Richard and Leslie divorced after 20 years in 1997 and he married his third wife, Sabryna Nelson-Alexopoulos two years later. On August 31st of this year, the author was involved in a landing accident with his plane on San Juan Island in Washington. He suffered serious head and shoulder injuries but has begun to recover slowly. 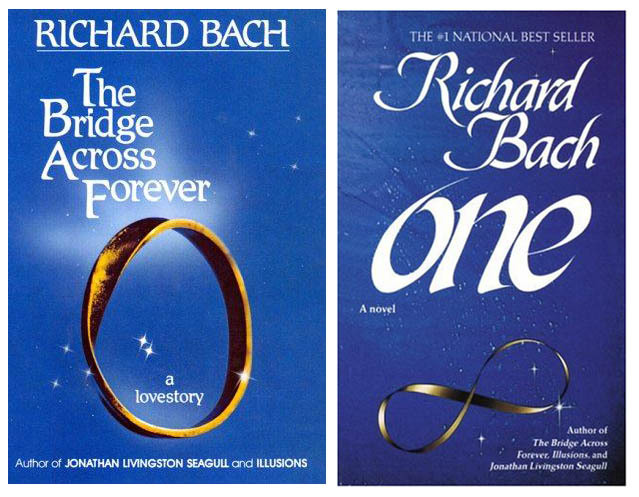 These two books, along with Jonathan Livingston Seagull, remain the only works by Richard Bach that I have read. I enjoyed rereading them, but was reminded again of how a writer’s personality, especially in semi-autobiographical stories, can sometimes get in the way of a great message. I wish him well in his recovery and hope that his stories have not come to an end. While Traitor’s Sun could have wrapped up the Darkover saga after Marion’s health began to decline, it is obvious from the ideas and partial tales that she left behind, her mind was still weaving plot twists and challenges for her favourite characters. Luckily, her talented friend and protégée, Deborah J. Ross was able to gather the pieces that Bradley had left unfinished and deftly weave them together into the fabulous adventure found in these pages. The Alton Gift is perhaps one of the most introspective of all the Darkover novels. While Marion never shied away from difficult topics or taboos, The Alton Gift takes a long hard look at the ethics necessary to deal with the power of “forced telepathic contact” that lies behind the Alton family talent. Marion Zimmer Bradley long admitted that the character of Lew Alton was her favourite and this novel finally allows the beloved character to lay many of his demons to rest in the twilight of his life. Deborah J. Ross was no doubt working with Bradley fairly closely until her death in September of 1999 and was intimately aware of how she felt at the end of her life, yet that sense of closure is easily felt by any reader picking up The Alton Gift. There is a sense of acceptance of self and accounting for one’s actions that makes this novel the most poignant of all the Darkover novels. While the torch has been successfully passed to the capable hands and heart of Deborah J. Ross, with possible stories about the Modern Darkover still forthcoming, this book remains the final Darkover novel in my mind. Marguerida and Mikhail’s son, Domenic grows into his own manhood throughout the challenges and twists of this tale as Lew Alton’s life settles finally into one of peace. There remains bits and pieces of the story for readers to imagine, but the saga itself is drawn to a poignant and satisfying close. I can only imagine how difficult it must have been for Ross to bring this story to a close and prepare it for publication without her beloved friend and mentor, but I commend her for providing readers with this wonderful gift almost a decade after Bradley’s death. Many of us had wished for one more visit to this wonderful world. Rereading all of the books this summer reminded me of what classics they truly are. Paperback format, 528 pages, published in 2007 by DAW Books. Despite devouring the books themselves in less than 5 days, it has taken me ages to sit down and write the reviews to the last 2 Darkover novels due to some chaos in our family’s life. During the past month, I may have struggled to write up my reviews, but I never stopped reading books for my challenge. I think the reading kept me sane! Traitor’s Sun picks up the story of Marguerida Alton and her husband, Mikhail some fifteen years after the adventures chronicled in Exile’s Song. Their life appears to be more settled now that they have children and a life as seconds-in-command to the aging Regis Hastur, but things in the Terran Federation are crumbling from within. Darkover may soon have to protect itself from desperate and ambitious Federation employees loyal to the powers off world rather than the planet they are stationed on. When the legendary Regent, Regis, dies amid this chaos, it provides the perfect opportunity for some to ignore the rules that they have always followed. Will Margeurida and Mikhail be able to save their planet with only their telepathic Laran powers? These last Darkover novels remain some of the best examples of Marion Zimmer Bradley’s writing talents. Traitor’s Sun not only showcases the fullness of her storytelling abilities, it allows the saga of a much beloved world finally come into its own. Paperback format, 534 pages, published in 1998 by DAW Books.